An indigenous Ngobe protester was killed by a gunshot wound to the chest during confrontations with the police this morning, 5th February, in San Félix, Panama. It has been confirmed that three more people have been hurt with local residents insisting many more are injured. In flat contradiction, the Security Minister Jose Mulino has stated that his officers are not carrying guns. In retaliation to the death, Ngobe protestors have set light to a police station in San Félix. Since 30th January, demonstrators have been positioned at various points along the international Interamerican highway using branches, pieces of wood, metal and rocks to block the road. They are protesting against the government’s decision to remove a law that would provide environmental protection to their lands. The police continue to deny that there has been any violence, although on Thursday 2nd January there were reports of up to 7 people injured in attacks involving tear gas. Early 2011 saw similar actions by thousands of Ngobe who protested the government’s amendment of the national mining law 415, which would have allowed for the commission of mines and other projects in the region. In March 2011, after talks between government officials and Ngobe leaders, it was agreed that article 5, which will protect the entire Comarca from exploration and exploitation, would be written into the mining law 415. Although the government has begun the exploration of other mines in Panama, the semi-autonomous Comarca holds an extremely considerable amount of mineral wealth. Not only is it home to Cerro Colorado – the second largest copper deposit in the world – but it hold several small but significant sites already under exploration by foreign mining companies. Don Clarke was also Vice President of sustainable development for Ecuacorriente, a subsidiary of Corriente Resources Inc, a company which was allegedly at the centre of human rights abuses and social conflicts in Ecuador. In early January, Hector Lopez, leader of the Association for the Rights and Social Development of the Ngäbe-Bugle People, stated at the National Assembly that he opposed article 5 as it would affect development in the region, and in his opinion, violate law 10, a founding law of the Comarca. Lopez is strongly in favor of mining in the region and believes the Ngobe should receive 50% of mining profits. As protests continue to swell on the highway, there are growing concerns over Panama’s freedom of press. On 20th January, a Canadian journalist and fixer, Rosie Simms, was denied entry into the country. She had been working on behalf of the Canadian broadcaster CBS who were covering a story about Canadian mining companies in Latin America. Many believe that this is symptomatic of a wider issue relating to freedom of press. A recent report by Reporters Without Borders revealed that Panama has dropped 58 places on the freedom of press index since 2010. As the protests continue, other parts of the country have joined in solidarity. 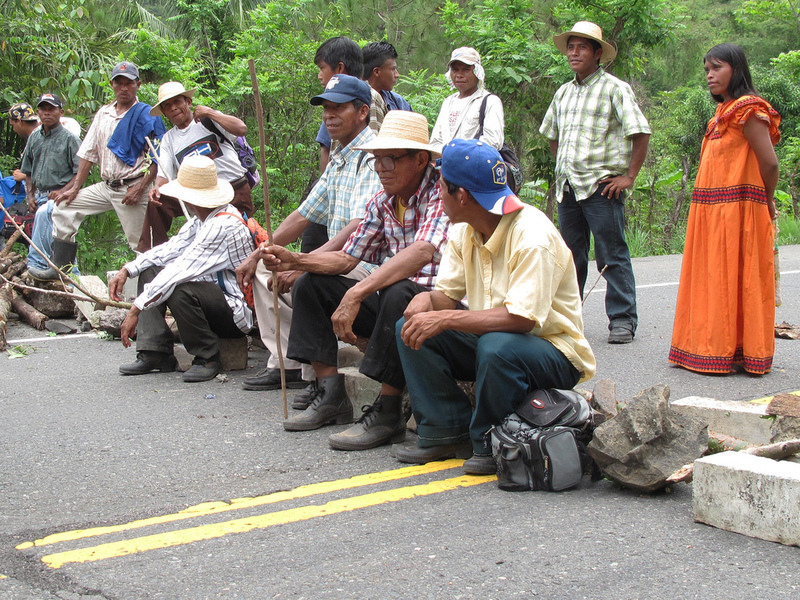 In Donoso district, Colón province, a group of Ngobe and campesinos have blocked a road to the Petaquilla mining project. In Bocas del Toro province, Banana plantation workers have announced that they will strike in 73 hours unless the government honors its agreements. Truckers, stuck in San Felix, have also pledged to strike. In the capital, many people have taken to streets in support of the Ngobe. After five days of protests there is major disruption throughout Panama. Market sellers in the capital have reported losses of up to $10,000. In Bocas del Toro, Banana Companies have estimated a loss of $270,000 due to road closures. According to the Chamber of Commerce the economy could face a total loss of over 10 million dollars. Meanwhile, the Costa Rican government has expressed concern that 270 of its citizens remain stuck in Panama due to the road closures. Pressure has been increasing for all sides to enter into talks. UN representatives in Panama have urged both Ngobe leaders and the government to begin ‘a peaceful dialogue’ and ‘to avoid violence.’ Although President Martinelli has said the situation is ‘reaching a limit,’ he has refused to reach out to the Ngobe. He also continues to undermine the legitimacy of the protests by accusing opposition parties of ‘manipulating’ them. In a continual distortion of the facts, the government has been using misleading rhetoric such as ‘kidnapped’ and ‘hostages’ when referring to travelers delayed on the highway. Yesterday morning, 4th February, mobile phone coverage was suspended along a large stretch of the highway where the protesters are concentrated. Later in the afternoon, six teachers were arrested in the city of Santiago whilst protesting in solidarity. The situation is extremely charged and tension is mounting across the country. As violence continues to unfold in San Félix, journalists and human rights organizations are being denied access to the area. The government continues to spread disinformation and there have been no attempts so far to reach out to the Ngobe and begin peaceful talks. Jennifer is a freelance journalist and teacher living in Central America. She spent two moving months volunteering in the Comarca Ngobe-Bugle in 2010.